AVAM is an inspirational complex of buildings and outdoor spaces. Every year there is a new thematic exhibition featuring "art produced by self-taught individuals, usually without formal training, whose works arise from an innate personal vision that revels foremost in the creative act itself." The exhibitions are distributed among the main building, encrusted with mosaics, the tall sculpture barn, and James Rouse Visionary Center. The Wildflower Garden includes aromatics, and climbing vines encircling visionary artist Ben Wilson's wooden meditation chapel and wedding altar. The garden was constructed in partnership with the TKF Foundation and includes the signature bench with waterproof journal in which visitors record musings. 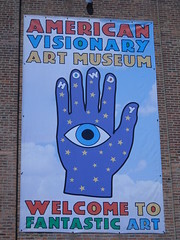 A giant whirlygig by Hollis Simpson announces the museum's presence from afar. 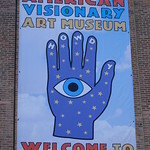 The Visionary Arts Museum is perhaps the coolest place in Baltimore. It's weird, engaging, different, beautiful -- and both young children and snobby art critics love it.